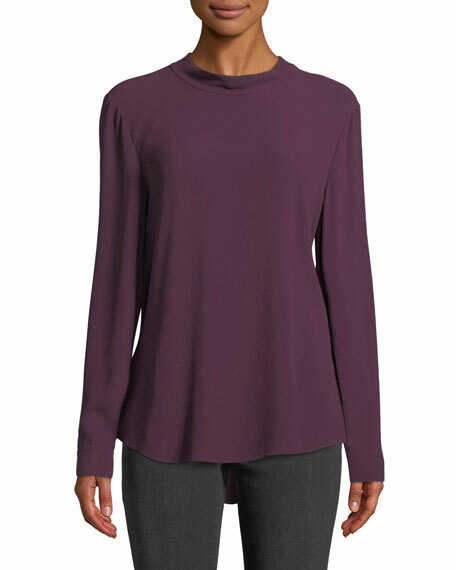 Eileen Fisher blouse with back necktie detail. For in-store inquiries, use sku #2665950. Chloe striped silk blouse. Stand collar with ties and grommets. Keyhole front. Long sleeves; button cuffs. Yoked back; box pleat. Eileen Fisher classic collar blouse in washed silk. Spread collar; button front. Long sleeves; button cuffs. Chest pocket at left. Eileen Fisher classic collar blouse in washed silk. Spread collar; button front. Long sleeves; button cuffs. Chest pocket at left. Yoked back; box pleat. Relaxed silhouette. Shirttail hem. Silk habutai. Hand wash. Imported. Elie Tahari "Karissa" modern dual-tone blouse. Mandarin collar; hook/keyhole V-front; fringe ties at sides. Long sleeves; contrast cuffs; cascading flounce. Elie Tahari "Nailah" semisheer tie-dye style blouse in silk. Spread collar; concealed button front. Long sleeves; button cuffs. Semi-fitted silhouette. Elie Tahari "Nailah" semisheer tie-dye style blouse in silk. Spread collar; concealed button front. Long sleeves; button cuffs. Semi-fitted silhouette. Side slits. Even hem. Silk. Dry clean. Imported.